GUMNUTS.....AND OTHER STUFF: South Coast to the Snowy Mountains. Days 1 & 2. (6th, 7th February). South Coast to the Snowy Mountains. Days 1 & 2. (6th, 7th February). The first 2 days of our 4 night/5 day excursion down the south coast to Eden then across to Jindabyne in the Snowy Mountains. We didn't get away until lunch time on the Thursday due to having stitches removed from my arm that morning. The first night was spent at Bateman's Bay. Not being a lover of main highways (put back all the curves I say) after Mogo we got onto the George Bass Drive to follow the coast to Moruya. We again left the highway just after Tilba Tilba to travel closer to the coast through Bermagui, Murrah, Tanja, Tathra, Merimbula and coming back on the highway at Pambula just above Eden, where we spent the second night. The countryside side was greenish through the Illawarra to Nowra then it was mainlly on the dry brown side. This weeks Flora Friday photos (taken on this trip) can be seen at Flora Friday in Oz. Looking south to Werri Beach from Mt Pleasant Lookout. Green pastures of the Illawarra from Mt Pleasant Lookout. Break-wall on the Clyde River, Bateman's Bay. I have heard of a 'Sea Cucumber' but never seen one, I hadn't heard of a 'Sea Tomato' but now I have seen one. Clyde River Bridge, Bateman's Bay. Bateman's Bay Water Gardens. More water than garden. Grey-headed Flying Fox (fruit bat) at the water garden. I don't know how this Kombi Van got registered. Water Buffalo from Mogo Zoo. Rock formations at Mossy Point looking towards Broulee Beach. Not a lot of life in the rock pools. Oh yes, the 'Komi Van' was only an 'Esky' (a portable insulated container for keeping food / drink cool). to make roofing material or a small canoe. View from scarred tree over salt marshes towards the Great Divide. One Tree Point, Tuross Heads. History wasn't kind to the original people of the south coast. "The total 'Brinja Yuin' population (local Aboriginal tribe) is believed to have been 1000 - 1500 people pre-European settlement. In 1847, 12 Aboriginal people (remnants of the local tribes) were rounded up from the local area and placed into a reserve at Turlinjah (6 kilometers from here). This local area, therefore, has a rich Aboriginal cultural history and poses many questions in relation to the sudden demise of the 'Brinja Yuin' people." One Tree Beach (South), Tuross Heads. Looking south from One Tree Point, Tuross Heads. The beach-worm catcher, Tuross Heads. Beach house styles, Tuross Heads. I wonder if they caught dinner, Narooma. End of the break-wall, Narooma. These Australian Fur Seals are now permanent residents on the break-wall. Montague Island off the coast from Narooma. The Japanese tourist were very happy to see the seals. Narooma in the background. Catamaran on the Wagona Inlet, Narooma. The village of Central Tilba. Back to the 50's at The Sweet Spot Cafe, Central Tilba. The Sweet Spot Cafe, Central Tilba. Enjoying a bit of shade, Central Tilba. One lane wooden bridge over the entrance to Wallaga Lake. Royal Spoonbills, Large Black Cormorant, Australian Pelican and Black Swans, Wallaga Lake. Camel Rock, Wallaga Lake ( I waited to see how big it would be when it stood up, it never did, must have been tied). Looking north from above the Blue Pool, Bermagui. The Blue Pool at Bermagui. 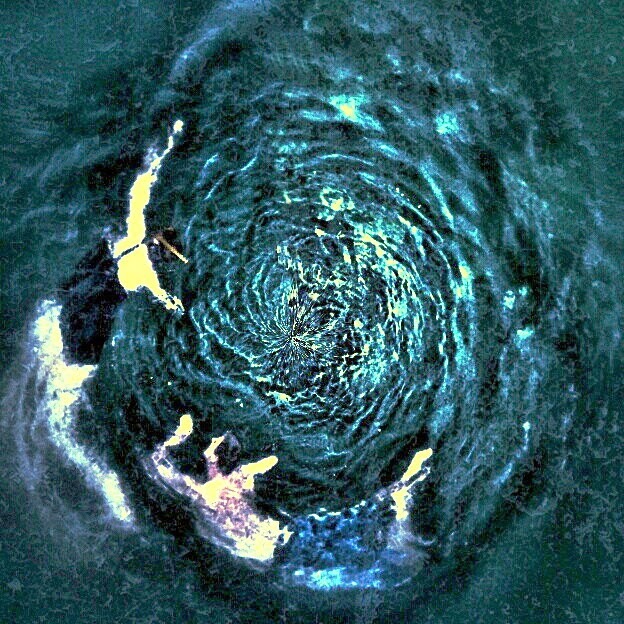 The Blue Pool at Bermagui (photo enhanced). The Tathra Wharf, built in 1862, is the only remaining coastal steamer wharf in NSW. Evening view from our motel (Twofold Bay Motor Inn) balcony, looking over Twofold Bay, Eden.